Here you are, searching online to try to figure out how to improve your serve, but you’re seeing the same information again and again. Well, let’s change that by digging deeper and uncovering the root causes most players struggle with. 1. Please read this blog post which includes easy to follow video lessons. There’s a checklist for you in this article that you can download for future reference. 2. Implement the tips the next time you go on the court and watch your serve improve. You can follow these 10 steps to hitting the best servs of your life. If you systematically go through the steps below, I guarantee your serve is going to be there for you when it counts the most. Ideally, having a continental grip is essential to your serve success. 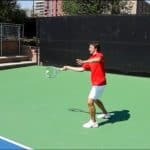 Many players have a forehand grip which limits their ability to swing the racquet along the correct swing path impacting the spin and speed that can be generated. Here’s a video of me demonstrating the Continental Grip. Don’t have time to finish this article? No problem, here’s where you can learn your #1 serve destroyer killing your serve potential. Click this link right here: Take this short serve quiz to learn your #1 serve destroyer. Many players have too much tension in their hand and arm, especially when they start the motion. 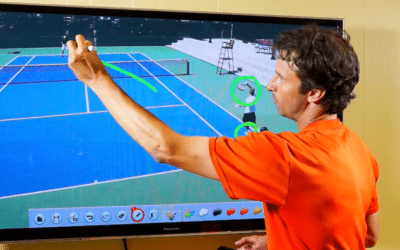 So when players prepare to serve they must become acutely aware of their grip tension. In other words, notice how tightly the hand is squeezing the racquet at the beginning of the motion and throughout the swing. See how relaxed the arm can be throughout the motion. Many players move fast at the beginning of the motion and bring their racquet up too early which throws off their rhythm and timing. The key is to have a slow tempo at the beginning of the motion before moving into the acceleration phase of the swing. Check out this lesson to learn more. Many players forget that aiming and targeting is so critical to the success of the serve. Players have to look at the spot where they want to hit to and do their best to hit the ball to that spot. It’s a lot like throwing a dart to a bullseye. If the ball doesn’t go to the proper target, continue to practice adjusting the aim until the consistency builds. Many players lack the proper shoulder turn to aid in effortless, efficient serving. When the upper body doesn’t work properly, natural easy power is difficult to come by. Getting more disguise to throw off the opponent is not attainable either. The timing of when to start the shoulder turn is important as well. Here is my take on the best way to do it. Even Roger Federer says the toss is important to him. Many players complain that their toss goes all over the place. Developing a consistent toss by learning the best place to locate the ball is critical. If you want to hit your best serves, become aware of how far out in front and how far left or right the toss goes. The moral of the story is to get that toss in the right place. You can take a short serve quiz to learn the #1 serve destroyer killing your serve potential. Just click here to take the short serve quiz. Many players have hitches in their serves. In other words, the motion looks jerky and is far from smooth. There is too much pausing and stopping in the middle of the motion. The key is to move the arm consistently and fluidly in a continuous fashion and that’s where the continuous swing drill comes in. This type of swing will really help with rhythm and timing. It’s very important that you develop the correct tempo on the serve. And as mentioned before in step 3, going slow at the beginning is important so that you can accelerate up to the contact point. You want to really accelerate that racquet so that the ball explodes off of the strings. This starts with a smooth, fluid, slower tempo at the beginning and a gradual building of momentum until the acceleration begins later in the swing and creates maximum impact at the contact point. That’s how you can get more effortless power. Many players try to use their legs to get more power, but they don’t do it correctly. Some players squat too much instead of using the hips in the right manner. This causes inefficiency with the serve. Here is a video where I show you what to avoid and what to focus on. Many players have the ability to jump into the court and land inside the baseline after making contact with the ball. 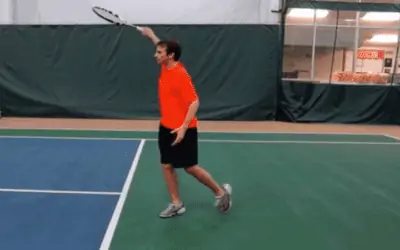 Other players have to step into the court after hitting the serve because they can’t jump. Regardless, you want to have some upward and forward momentum into the court. 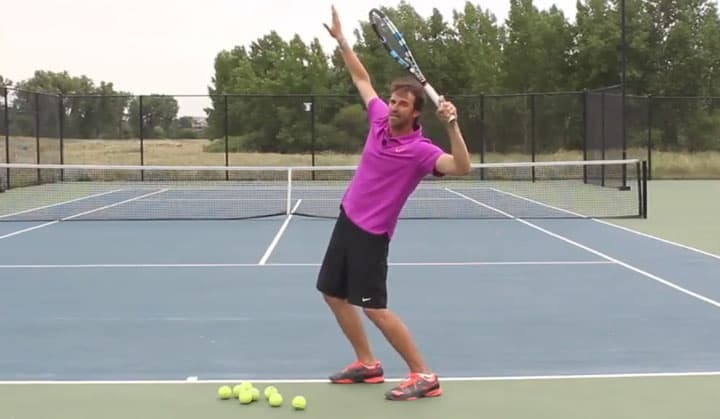 Get that body momentum going up and forward in order to hit successful serves. Bonus Step: Make adjustments on the next serve. 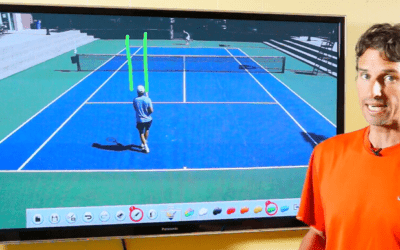 Most players are unaware of how to fix their serve mistakes. They miss serves and have no awareness of how to change their targets or their focus to get a different result. Sometimes making micro adjustments can make all the difference on the next serve that is hit. 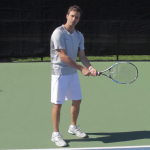 Players can focus on hitting the serve higher over the net or lower so that it just skims above the net tape. Maybe the next serve needs more spin or cleaner contact with the ball. The key is to become more aware so that positive changes can be made on the next serve. This is not the time to get upset. It’s a time to stay focused on the process without negative emotions getting in the way. So those are your 10 steps and a bonus one to develop your best serves ever. Practice these different erve tips when you go out on the court. Be smart about only focusing on one or two of these concepts at a time until there is noticeable improvement. Then move to another step outlined above. Avoid doing all the steps at once because it can feel overwhelming if you try this. Start feeling successful with these steps and watch how much the serve improves and becomes a weapon. Awesome! Take this short quiz to learn your #1 served destroyer killing your serve potential. Just click the link below to take a short serve quiz and we will reveal what your #1 serve destroyer is that is holding you back. Take this short quiz to learn your #1 serve destroyer killing your serve.